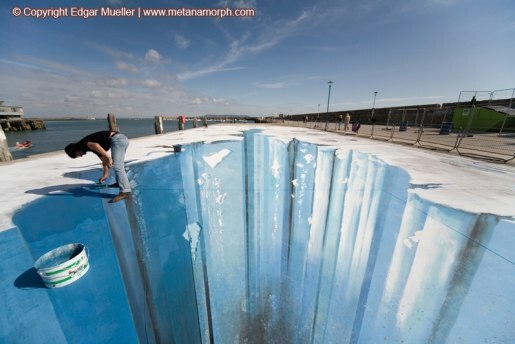 German 3D pavement artist Edgar Müller, created a three dimensional painting of an ice age crevasse at the Festival of World Cultures in Dún Laoghaire (Dunleary) in Ireland. Pedestrians standing in the right spot were treated to the illusion of being on the edge of hazardous ice-filled hole in the East Pier. In August 2008 Müller spent five days transforming a large section of the East Pier into a dramatic ice age scene, with help from up to five assistants at a time. Using anamorphic technique he was able to create the illusion of pedestrians either standing on the edge of the crevasse, or walking on air. Müller’s time-lapse making-of video was posted on YouTube on February 15, 2009, viewed over 546,000 times in just under two weeks. This project was supported by the Goethe Institution, Germany.